Perfect 5 Piece Japanese Sake Set(Including sake pot and 4 cups) Material:Ceramic Certification:CIQ Type: Sake & Tea Set Size: Sake pot: Caliber:5cm Height:14cm Capacity:150ml Sake cups: Caliber:4cm Height:4cm Capacity: 50ml Package include: 1 x Sake Pot 4 x Sake Cups. Type: Sakura Pot & Tea Set. 1 x Sakura Pot. Master-level technology of spurt draws not only give this ceramic exquisite appearance, but also make the ceramic to emitclassic lasting appeal. Pot: 6.2 15.8cm/ 2.4"x 6.2". 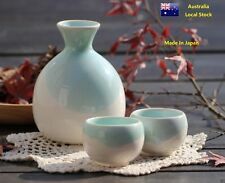 $Welcome To Contact Us For Low Price Bulk Sale - 5 Piece Sake Set,Including 1 Sake Bottle And 4 Small Cups - Made of High Quality Porcelain - Beautiful Japanese Traditional Sakura Pattern With Poems Handwriting - In Gift Box - Easy To Clean,Dishwasher Safe - Size Please See Picture. Limited Stock!!! - 4 Piece Set Including 2 Cups, 1 Bottle And 1 Bowl Warmer - Japanese Traditional Cup And Bottle Design - Bottle Come With Japanese Traditional Hemp Rope Holder And Cork Cover - Simply Fill The Bowl With Hot/Cold Water And Put The Bottle In For Warming/Cooling - In Luxury Gift Box - Bottle Height: 11cm Bottle Volume: 250ml - Cup Height: 6cm Cup Volume: 70ml - Bowl Warmer Height: 6cm Bowl Warmer Top Diameter: 10.5cm Bowl Warmer Volume: 380. $"Underglaze Colour" Is A Great Innovation In Ancient China Porcelain History,And The Secret "Furnace Transmutation" Effect Gives Two Colors To Porcelain Pieces In Just One Baking Process,Two Colors Fading Into Each Other Make Them Truely Art Pieces. - 3 Piece Sake Set Including 1 Sake Bottle And 2 Small Cups - Made of Secret "Underglaze Colour" And "Furnace Transmutation" Formula - Beautiful Sky Green And Snow White Color Fading Into Each Other - Nice Gift Box - Easy To Clean,Dishwasher Safe - Hand Made In Japan,Top Quality - Size: Bottle Hight 11cm,Top Diameter 4cm;Cup Height 4cm,Top Diameter 5cm - Volume: 320ml For The Bottle,50ml For Cups. Contends: 2x sake bottle, 5x Sake Cup. Size : Bottle W5.5cm, H13cm 180cc. Colour: Black. Cup W4.7cm, H4.7cm. Lovely Japanese Sake Set - 12 Piece. Porcelain of good quality and is quite fine and light. $- 5 Piece Sake Set Including 1 Sake Bottle And 4 Cups - Made of High Quality porcelain - Beautiful Japanese Traditional Sakura Pattern In Lovely Pinky Color - Nice Gift Box - Easy To Clean,Dishwasher Safe - Size: Bottle Hight 12.5cm,Bottom Diameter 5cm,Top Diameter 4.5cm;Cup Height 4.8cm,Top Diameter 4.8cm - Volume: 120ml For The Bottle,30ml For Cups. 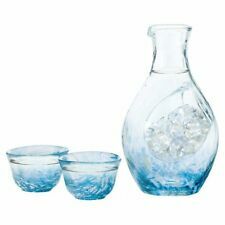 $Welcome To Contact Us For Low Price Bulk Sale - 5 Piece Sake Set Including 1 Sake Bottle And 4 Small Cups - Made of High Quality Porcelain - Beautiful Snow View Pattern - Deluxe Gift Box - Easy To Clean,Dishwasher Safe - Size: Bottle Hight 14cm,Bottom Triangle Length 6cm,Top Triangle Length 3.5cm;Cup Height 4cm,Top Diameter 5cm - Volume: 120ml For The Bottle,40ml For Cups. Porcelain with hand painted design. Made in Japan. The cup is suitable for water, wine, arrack. Made of high quality procelain, it is non-toxic and safe to use. The design looks very nice and will add unique taste to any bar room. 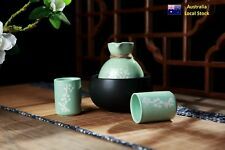 - Plain procelain sake set decorated with ink painting. Contends: 1x sake bottle, 2x Sake Cup, 1xTray. Tray 18cmx16cm. Size : Bottle W7cm, H11.8cm. Colour: Blue. Cup W5cm, H3.5cm. Contends: 1x sake bottle, 2x Sake Cup. Size (approx) : Bottle W8.4cm, H12.2cm, 400cc. Colour: White. Cup W6.8cm, H4cm. Bottle size approx. 12.5 cm (H). White porcelain with teal glaze and gold trim. I had it since 1986. It had wine in it I drank it I am sorry. STANDS - 20 CMS HIGH. PERFECT CONDITION. Lovely Vintage Japanese Bottle, blue and white ceramic. Measures about 19 cm tall and about 8 cm wide. Contends: 1x sake bottle, 2x Sake Cup. Size : Bottle W8.5cm, H13cm. Colour: Black. Cup W5.8cm, H5.5cm. BEAUTIFUL SATSUMA PORCELAIN SET MADE IN JAPAN C 1950. FOR YOUR CONSIDERATION: BEAUTIFUL HAND CRAFTED AND DECORATED PORCELAIN JAPANESE SAKE SET IN BAMBOO BOX UNUSED. WONDERFUL ADDITION FOR THE SAKE LOVERS OR A BEAUTIFUL GIFT. Up for sale is this pottery Karakara Awamori Sake Bottle made in Japan which has been decorated with a Geisha Girl design and glazed so far down and then leaving an unglazed bisque bottom. The Art of Chokin Chokin art has a long standing history in the Japanese culture. These gilded plates and other objects have captured the interest of many collectors from both Eastern and Western backgrounds. Type: Sakura Pot & Tea Set. Master-level technology of spurt draws not only give this ceramic exquisite appearance, but also make the ceramic to emit classic lasting appeal. Pot: 6.2 15.8cm/ 2.4"x 6.2". Beautiful porcelain bowl from Japan decorated with a variety of Chinese snuff bottles. Never used. The cup is suitable for water, wine, arrack. Made of high quality ceramic, it is non-toxic and safe to use. The design looks very nice and will add nicely to any bar room. - Plain ceramic sake set decorated with Kanji Calligraphy. Size : Carafe 300ml φ45 × 165mm × 1 · Cup 55ml φ65 × 52mm × 2. Material : Glass. Specification: Handmade Pottery clay Beautiful glaze with a smooth touching Lead free, Non-toxic, tasteless Effectively holds heat for longer Microwave and dishwasher saf Features: 1. After three years' reserch, Japanese engineers and technicians developed the distinctive environmental protection material of pottery, which is been firing under high temperature. 2.The firing temperature is 1330 degrees Celsius, All the harmful metal(lead) which in the clay has completely burn out; Homemade secret recipe of the glaze. 3.Non-toxic, tasteless, lead-free, and none the effect of bright color. 4.Japanese technology, made in China. Size: Sake pot: Caliber:6cm Height:13cm Capacity:150ml Sake cups: Caliber:5cm Height:4.5cm Capacity: 50ml Package include: 1Pcs x Sake pot and 4Pcs x Cups. Kiyomizu ware (清水焼 Kiyomizu-yaki) is a type of Kyō ware traditionally from Gojōzaka district near Kiyomizu Temple, in Kyoto. Jigsaw Puzzles), Japanese snacks (incl. We can provide support in both English and Japanese. Jigsaw Puzzles), Japanese snacks (incl. We can provide support in both English and Japanese. RARE Japanese Yakusugi Sake Set. Jigsaw Puzzles), Japanese snacks (incl. We can provide support in both English and Japanese. Made in Mino Japan. Large sake bottle: Φ 56mm x H 175mm (275ml). Small sake bottle : Φ 53mm x H133mm (150ml). Sake cup: Φ 50mm x H 43mm (70ml). Japan Usage Item. Type: Sakura Pot & Tea Set. 1 x Sakura Pot. Master-level technology of spurt draws not only give this ceramic exquisite appearance, but also make the ceramic to emit classic lasting appeal. Pot: 6.2 15.8cm/ 2.4"x 6.2".